When you click the Search and mark button in the Files and folders window, ReclaiMe Pro opens a new window where you can specify various search criteria. Take into account that when searching the recovered files and folders for specific objects, ReclaiMe Pro starts at the selected folder and then goes down the folder tree. There are several tabs where you can specify various search criteria. 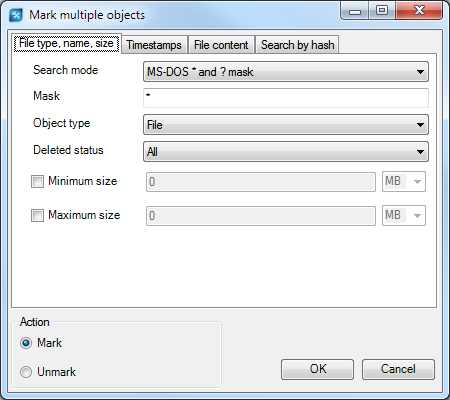 Using Search mode you can set which mask should be applied when searching the recovered data for an object with a specific name. Substring search – ReclaiMe Pro searches for names containing the value typed into this field, not case sensitive. MS-DOS * and ? mask, not case sensitive. Using the Object type parameter you can tell ReclaiMe Pro which objects you need: all, files, or folders. You can choose one of the following: all, not deleted, or deleted only. On filesystems where detection of deleted files is not available, search for deleted files matches nothing. Additionally, you may specify minimum and maximum size for objects to search. Note that when recovering data, it sometimes happens that creation and modification time of a particular file cannot be retrieved, so you should be careful when using a time mask. Keep in mind that these search criteria make sense only when the Test files function was applied to the recovered file set. Generally, ReclaiMe Pro analyses the file in question trying to find out whether it can be a file of the declared extension (as taken from the file name). To do this ReclaiMe Pro uses special algorithms; however, all the file content is not tested. It should be noted that content type mismatch may happen for reasons other than intentional renaming, for example due to file content corruption. When checked, allows you to specify content type ReclaiMe Pro should search the file set for. When analyzing content type, ReclaiMe Pro considers the real file content rather than file extension. 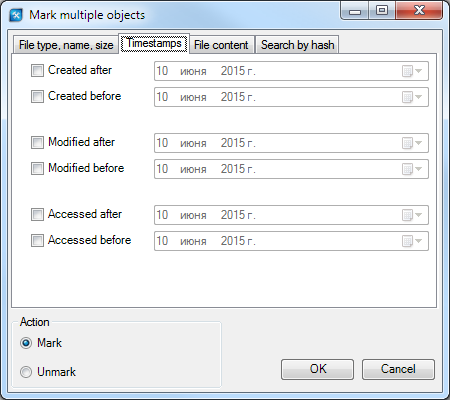 In ReclaiMe Pro, you have a capability to search for the files matching the known MD5/SHA-1 hash values. This feature helps you both identify the known good files and suspected files. 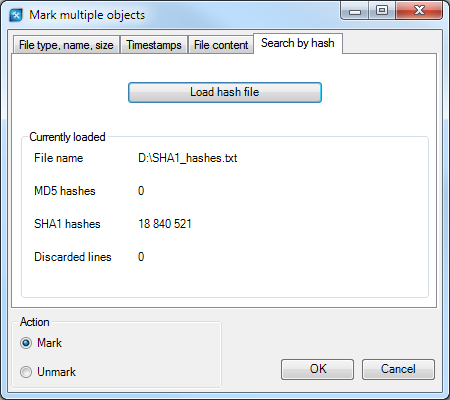 To identify the known good files you should load the file (use the Load hash file button) containing the hash values, for example from the National Software Reference Library offering to download the files with MD5 and SHA-1 hashes. Hash value – 16 hexadecimal symbols for MD5 hash or 20 hexadecimal symbols for SHA-1. Optional custom symbols, for example file name. Once the hash file is loaded, ReclaiMe Pro informs you how many hash values were extracted from the file. Discarded lines shows the number of hashes which were not loaded for some reason, for example due to incorrect format. Note that Search by hash should be used only when Test files which calculates hash values for the recovered files was applied in advance. The parameter is used to tell ReclaiMe Pro what to do with the objects that match the search, Mark or Unmark. If you choose Mark, all the found objects will be marked while all the previously marked objects are not affected. When you choose Unmark, all objects matching the search criteria (both marked in the previous searches and marked manually) will be unmarked.